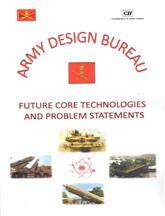 Mr Manohar Parrikar, Defence Minister of India and General Dalbir Singh, Chief of the Army Staff released "Compendium of Future Technologies and Statement of Problems" at the Army Technology Seminar on Common Technologies and Advanced Materials for Land Systems jointly organised by the Indian Army and CII in New Delhi on 5th December 2016. The Compendium is an outcome of detailed iterations carried out with major stakeholders, namely, the Field Army, Training Institutions and Planning Establishments. The ‘Felt Needs’ and ‘Future Core Technologies’ as pertaining to various domains have been dwelled upon appropriately for all stakeholders to explore suitable solutions. These include Armoured Fighting Vehicles, Night Vision & Power Packs / Engines, Combat Soldier, Artillery, Combat Engineering : Future Technologies, Information & Communication Technology, Army Air Defence and Army Aviation. The compendium also includes 50 Problem Definition Statements related to these technologies.